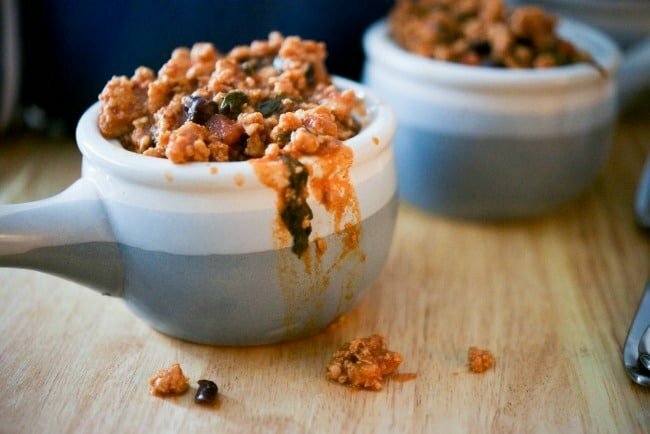 Make this comforting Black Bean, Chicken & Spinach Chili on top of the stove or allow it to simmer all day in your crock pot. 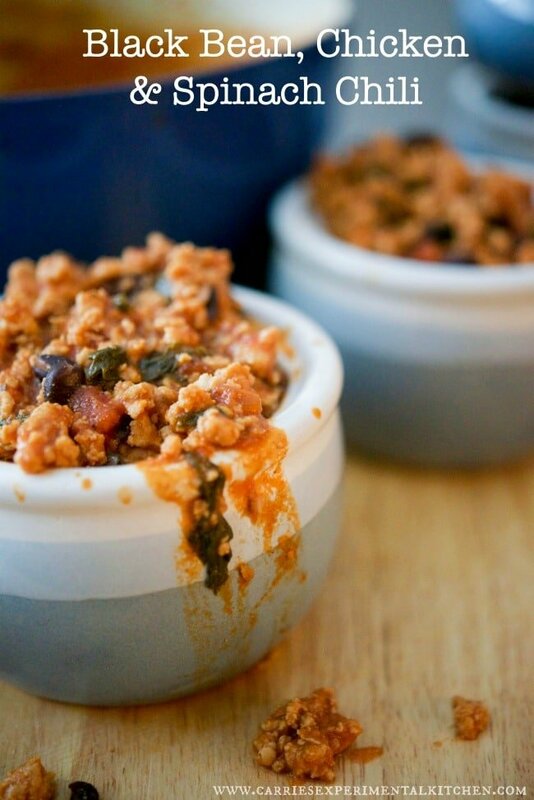 My husband was recently in the mood for chili, but all I had in the house was ground chicken and black beans. 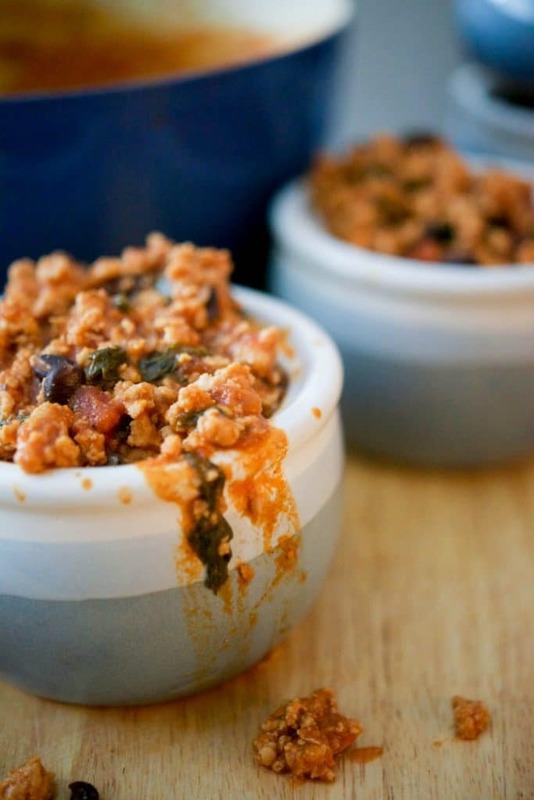 Then I remembered that I had made a recipe a few years ago for a Black Bean, Chicken and Spinach Chili. I searched the blog for the recipe and decided that I was going to make it for dinner this particular night. Now the beauty of going back to these older recipes is two-fold. ONE-I rarely make the same meals over and over again so that I can experiment with new recipes to post here on the blog, so I enjoy when I get to make them again. TWO-When I do find an older recipe I gasp at how horrible the photo was and use this as an opportunity to revise the post with new images and bring it back to life. Start off by browning your ground chicken in a Dutch oven or large pot on top of the stove with a little bit of olive oil. 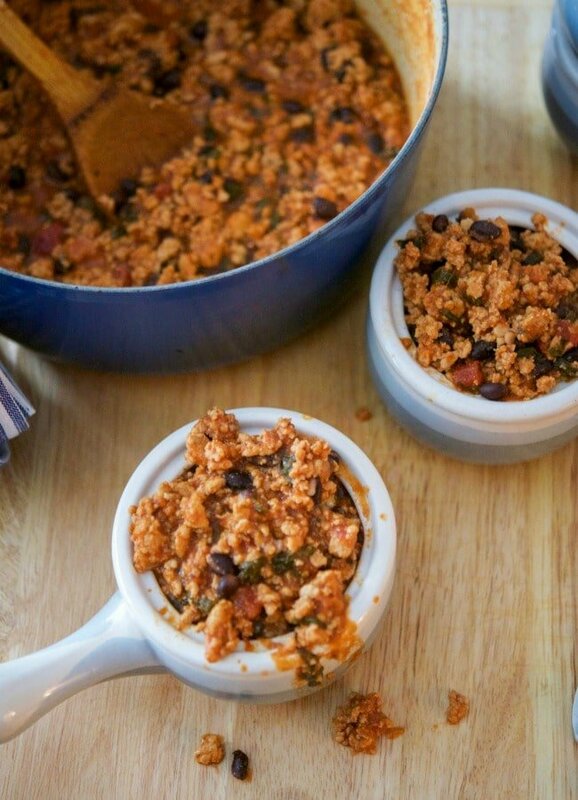 You could also substitute ground turkey or lean ground beef for the chicken if you prefer. Watch your prices because often times, ground chicken is less expensive than ground turkey. Cook the chicken until there is no pink left; then add chopped onion and garlic. Sauté until the onions start to soften (approximately 1-2 minutes). You can also add chopped green peppers; however, my family doesn’t like them so we leave them out. Next, add the chili powder, cumin, black beans, baby spinach, plum tomatoes, tomato paste and water; mix well. Reduce heat to low, partially cover pot and allow to simmer for at least 30 minutes. If you’re going to be out for the day, you could also cook this in your crock pot. Follow the instructions above until all of the ingredients have been added; then place in your crock pot instead of simmering on top of the stove. Cook on low 6-8 hours or high 2-4 hours. 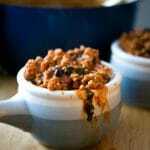 Make this heartwarming chili as mild or as hot as you like by adjusting the quantity of chili powder to your liking. Once the chili is done, season with salt as desired. I don’t like to add a lot of salt to my recipes because some products already contain quite a bit already and I’m a bit of a salt-o-holic and salt EVERYTHING. This way you can add as much or as little as you feel you need after the recipe is done. I find that by not adding salt to my food when I’m cooking it, I use a lot less salt this way too. 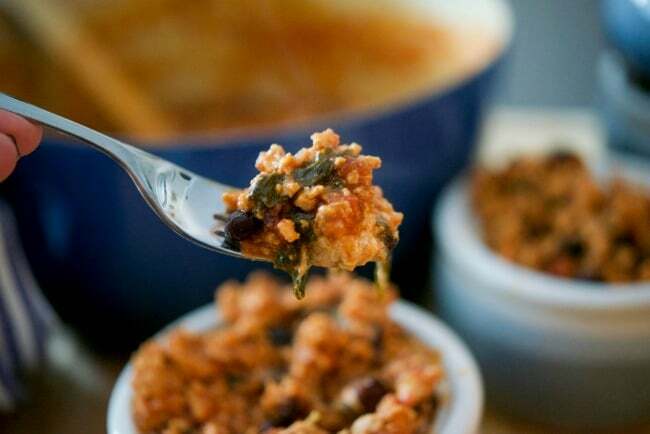 My family really loved this Black Bean, Chicken & Spinach Chili and I was so glad I made it again. 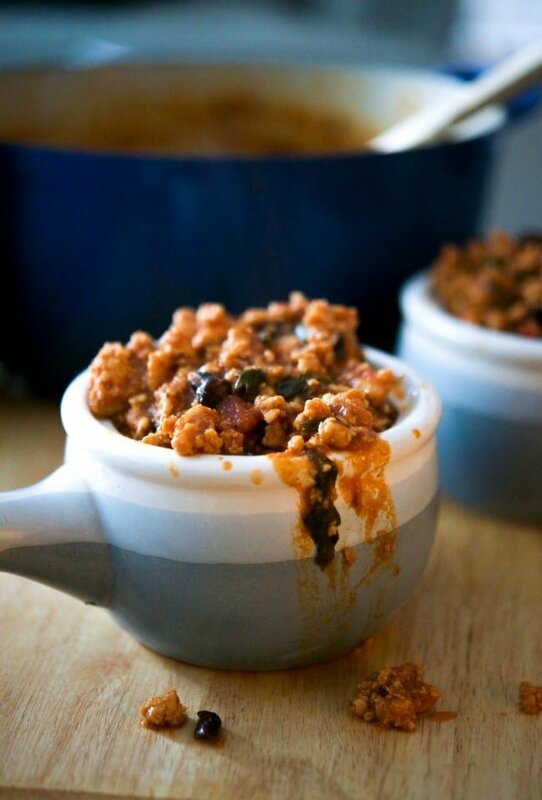 We do have a few other chili recipes that we like, but I think this one is our favorite. In fact, he’s already asked for me to make it again and I’m more than happy to oblige. Between me going back to work and the weather getting much cooler, this is the perfect meal to make for a busy weeknight and even freezes well. Serve with rice or egg noodles and a tossed salad and dinner is ready before you know it. ~Enjoy! Heat the oil over medium heat in a Dutch oven or large pot. Brown the chicken until it is cooked through and there is no pink. Add the onions, garlic, chili powder and cumin; stir for about 2-3 minutes. Next, add the beans, tomatoes, spinach, tomato paste and water; mix well. Reduce heat to low and simmer partially covered for a minimum of 30 minutes stirring occasionally. *You may also add all of the ingredients to your crock pot and cook on Low 6-8 hours or High 2-4 hours. **Add chopped peppers or other garden vegetables as desired. This post includes links to my affiliate account at Amazon.com where Carrie’s Experimental Kitchen earns a few cents on the dollar when readers like yourself purchase the items I recommend. Thank you for supporting Carrie’s Experimental Kitchen when you shop at Amazon. I gave you a blog award.. stop by and check it out! I’ve made it several times already, it’s one of our favorites!